If you are looking for a reason the United States urgently needs to update its nuclear posture review, which is generally done every eight years, look no further than this sentence from the last review in 2010.”While policy differences continue to arise between the two countries and Russia continues to modernize its still-formidable nuclear forces, Russia and the United States are no longer adversaries, and prospects for military confrontation have declined dramatically.”That was then; this is now. “A resurgent Russia has turned from partner to antagonist as it seeks to re-emerge as a global power,” Gen. Curtis Scaparrotti, NATO’s supreme allied commander, told Congress in March. Russia has not only morphed from “frenemy” to full-blown enemy since its 2014 covert invasion and subsequent annexation of Crimea, but it has also updated its nuclear doctrine to intimidate NATO nations along its periphery, as well as former Soviet states, including Ukraine and Georgia. It’s a strategy known as “escalate to de-escalate,” the idea that a limited nuclear strike with a tactical or “battlefield” nuke could shock the U.S. into freezing a conflict in place. “It’s one of the most challenging military questions you have,” Air Force Gen. John Hyten, the commander of America’s nuclear forces, testified before the Senate Armed Services Committee last month. Hyten said “escalate to de-escalate” is really a strategy of “escalate to win,” which views the use of nuclear weapons as a normal extension of a conventional conflict. While Russia remains America’s only peer in the area of nuclear weapons capabilities, China has been embarked on an ambitious military modernization campaign that includes both “qualitative and quantitative” upgrading of its nuclear arsenal, according to the last nuclear posture review. And then there’s North Korea, whose leader Kim Jong Un has a stated goal of developing intercontinental ballistic missiles with the capability of delivering a nuclear warhead to a city on the U.S. mainland. Hyten said that while the U.S. has de-emphasized the role of nuclear weapons for the past two decades, its adversaries have done the exact opposite. It is, according to Air Force Chief of Staff Gen. David Goldfein, a grave new world. It’s against this backdrop that President Trump directed Defense Secretary Jim Mattis to begin a sweeping review of all aspects of U.S. nuclear deterrence policy, everything from how many warheads the U.S. needs, to how many delivery systems, to what threats the U.S. may need to counter in the coming decade. Last month, Mattis assigned the task to the deputy secretary of defense and the vice chairman of the Joint Chiefs of Staff and set a deadline of the end of 2017. But even before the formal directive, the work had already begun, Hyten said. And it’s not just one review but multiple studies, including a review of the ballistic missile defenses and the appropriate response to Russia’s violation of the Intermediate-Range Nuclear Forces Treaty with its recent deployment of a land-based cruise missile. “I suspect there will be serious consideration of recommending pulling out of INF treaty and not extending New START,” said James Carafano, a defense analyst at the Heritage Foundation. But Hyten said it appears Moscow is adhering to the New Strategic Arms Reduction Treaty agreement, which calls for both sides to be limited 1,550 deployed warheads and 700 deployed delivery systems by February 2018. “From a strategic weapons perspective, I support the limits that are in the New START,” Hyten testified, adding that withdrawing from the treaty would not be part of the review. Also off the table is consideration of eliminating any of the three legs of the nuclear triad, the Cold War strategy under which the U.S. maintains the capability to deliver nuclear weapons from submarines, bombers and land-based ICBMs. The 30-year triad modernization plan calls for a new Columbia class of ballistic missile submarines, new B-21 Raider long-range stealth bombers, and new replacement ICBMs known as the ground-based deterrent, along with new bombs and cruise missiles. It is projected to cost $1 trillion. But Michael O’Hanlon, an analyst at the Brookings Institution, said the review should not just be about counting warheads and systems but about the role nuclear deterrence can play in maintaining peace and stability. But with Russia thinking differently about the role of nuclear arms in the 21st century, the U.S. may have to adjust its calculus too, argued Armed Services Committee Chairman Sen. John McCain at last month’s hearing on the U.S. Strategic Command. Military options for dealing with the North were still “on the table”, Tillerson warned in his first address to the UN body. The launch ratchets up tensions on the Korean peninsula, with Washington and Pyongyang locked in an ever-tighter spiral of threat, counter-threat, and escalating military preparedness. US President Donald Trump, who has warned of a “major conflict” with North Korean leader Kim Jong-Un’s regime, said the latest test was a pointed snub to China — the North’s main ally and economic lifeline. “North Korea disrespected the wishes of China & its highly respected President when it launched, though unsuccessfully, a missile today. Bad!” Trump tweeted. The US is deploying a naval strike group led by an aircraft carrier to the Korean peninsula, and a missile-defence system called Terminal High Altitude Area Defense (THAAD) that officials say will be operational “within days”. North Korea recently conducted its biggest-ever firing drill and has threatened to “bury at sea” the US aircraft carrier, and there are signs it could be preparing for a sixth nuclear test. South Korea’s defence ministry said it suspected Saturday’s missile test had failed after a brief flight, while the US military’s Pacific Command confirmed the rocket did not leave North Korean territory. Japan has lodged a “serious protest and criticism” to the North, Chief Cabinet Secretary Yoshihide Suga told reporters after a national security council meeting. China pushed back at Tillerson’s call at the UN Security Council for it to do more to rein in Pyongyang, arguing that it was unrealistic to expect one country to solve the conflict. “The use of force does not solve differences and will only lead to bigger disasters,” Chinese Foreign Minister Wang Yi said. His country, he said, should not be “a focal point of the problem on the peninsula” and stressed that “the key to solving the nuclear issue on the peninsula does not lie in the hands of the Chinese side”. Russia joined China in saying a military response would be disastrous and appealing for a return to talks and de-escalation. Military action was “completely unacceptable”, Russian Deputy Foreign Minister Gennady Gatilov told the council, and a miscalculation could have “frightening consequences”. But Tillerson argued that diplomacy had to be backed with credible muscle. “Diplomatic and financial levers of power will be backed up by willingness to counteract North Korean aggression with military action, if necessary,” he said. The meeting of the top UN body on Friday laid bare major differences among key powers over the way to address the North Korea crisis. Over the past 11 years, the Security Council has imposed six sets of sanctions on Pyongyang — two adopted last year — to significantly ramp up pressure and deny the North Korean regime the hard currency revenue needed for its military programmes. But UN sanctions experts have repeatedly told the council the measures have had little impact because they have been poorly implemented. Tillerson called on all countries to downgrade or sever diplomatic relations with North Korea and impose targeted sanctions on entities and individuals supporting its missile and nuclear program. The US is ready to impose sanctions on third countries where companies or individuals are found to have helped North Korea’s military programmes, he said. China instead wants Pyongyang to freeze its military programmes in exchange for a halt to US-South Korean annual drills. “Now is the time to seriously consider talks,” said Wang. But Tillerson was blunt in saying it was up to North Korea to take the first concrete steps. The US, Russia and China took part in six-party talks on North Korea’s denuclearisation from 2003 to 2009, along with Japan, South Korea and Pyongyang. China gives N. Korea’s ICBMs vital mobility; both use a large 16-wheel CASIC transporter erector launcher (TEL). Any relief from the burgeoning nuclear threats posed by North Korea, Pakistan and Iran must first require the dispatch of a common core threat: China’s policy of providing direct and indirect assistance to make each a nuclear missile state. North Korea’s latest, 15 April 2017, military parade provided a new round of evidence of China’s overt support for Pyongyang’s nuclear missile capabilities. China has been assisting North Korean missile capabilities since the 1970s, but after President George Bush’s 2003 invasion of Iraq, China reacted by initiating the “Six Party Talks” to stall any military action and began to arm Pyongyang with a new generation of weapons. This program has now advanced to assisting North Korea’s near-term progression from liquid-fuelled larger missiles like the KN-08 intercontinental ballistic missile (ICBM), to a new solid-fuelled ICBM. Liquid-fuel missiles require a lengthy period to load their fuel, in which they are vulnerable to attack, whereas solid-fuelled missiles are ready to fire almost immediately. 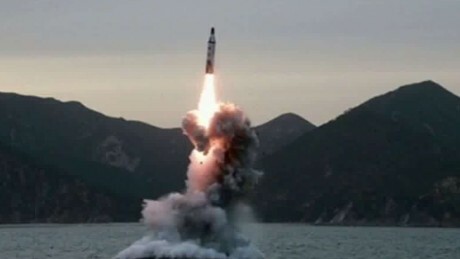 In the 15 April parade, North Korea displayed its KN-11 submarine launched solid-fuelled ballistic missile and its slightly larger tube cold-launched land-based Pukguksong-2 solid-fuel medium range ballistic missile (MRBM). It also displayed indications of two future solid-fuel missiles, a new land-based MRBM and a new large solid-fuelled ICBM. But China gives North Korea liquid and solid-fuelled ICBMs vital mobility; both use a large 16-wheel China Aerospace Science and Industry Corporation (CASIC) transporter erector launcher (TEL). China transferred about 8 of these sophisticated vehicles to North Korea in 2011 and they appeared in the 15 April parade, carrying a new large cold-launch missile tube similar in size to the latest Chinese and Russian mobile solid-fuelled ICBMs. China may not have transferred more 16-wheel TELs since 2012, but an indicator this is a deliberate Chinese policy to aid North Korea’s missiles is further illustrated by the 2013 Tokjung Truck Joint Venture Company with the China National Heavy Duty Truck Group, or “Sinotruk”. These trucks are assembled from parts made in China. In the latest parade, a truck cab derived from a Sinotruk A7 tractor-trailer cab, tows the new North Korean solid fuel MRBM that looks much like the early Chinese DF-21 MRBM. This means that the Sinotruk joint venture may be able to produce a larger tractor-trailer TEL for the new large solid-fuelled ICBM, like China’s first DF-31 solid-fuel ICBM. In addition, Sinotruk chassis are used to transport a new 300mm precision guided artillery rocket first revealed in 2015 and to tow the KN-11 in the most recent parade. Sinotruk officials have stated that they have no control over whether North Korea uses their trucks for military purposes. This is not credible. If China had wanted to comply with longstanding United Nations sanctions against helping North Korea’s missile program, it would have closed the Sinotruk joint venture and halted other Sinotruk sales as well. China also provides missile technology and large TELs to Pakistan to support its nuclear missile program. In its 23 March 2016 military parade, Pakistan’s Shaheen-III nuclear armed solid-fuel MRBM was carried by a slightly different version of the same CASIC 16-wheel TEL transferred to North Korea in 2011. But should China wish to conceal this form assistance, it can now prompt the Sinotruk Joint Venture to manufacture tractor-trailer type TELs for Pakistan’s future large nuclear missiles. Pakistan has had a longstanding nuclear and missile technology relationship with North Korea, to include the sharing of liquid fuel missile technology and nuclear warhead designs, and there should be concern about future cooperation. Pakistan does not yet have large cold-launch missile tube technology, which North Korea may soon develop. These tubes ease the storage of large solid-fuel ballistic missiles and provide a relatively safe means of launching such missiles. North Korea may not yet have Pakistan’s technology for equipping missiles with multiple warheads. On 23 January 2017, Pakistan tested its ABABEEL missile, a Shaheen-II/III MRBM equipped with multiple warheads. Indian sources familiar with this test confirmed that it lofted three warheads, but were sceptical that it achieved a sufficient level of accuracy. These sources also conclude that China was the likely source for this multiple warhead technology. This would be logical, given that most of Pakistan’s solid fuel missile technology comes from China. China would want a multiple warhead capability to give Pakistan’s missiles a greater chance of surviving India’s future missile interceptors. Beijing would also approve of North Korea’s acquiring multiple warhead technology to increase its ability to survive US missile defences. So, might there be future commerce between Pakistan and North Korea, exchanging the latter’s truck-TEL and cold-launch missile tube technology for the former’s multiple warhead technology? This would allow both to deploy their larger solid-fuel ballistic missiles with speed and greater safety and help North Korea’s new large solid-fuel ICBMs to much sooner achieve a multiple warhead capability. China apparently rejects any notion that it is responsible for helping to create these new nuclear missile threats. When asked about its large TEL transfer to North Korea back in 2012, China reportedly told Washington this transfer was a “mistake”. Chinese officials thought the North Koreans would use TELs designed for missiles to instead transport lumber. At that time, the Barack Obama administration did not want to make a public issue of China’s blatant proliferation. What has China done to reward such US discretion? It has turned the US deployment to South Korea of the defensive Theater High Altitude Area Defense (THAAD) missile interceptor into a crisis in China-South Korea relations. It seems that South Koreans are not allowed to be defended from the North Korean nuclear missiles that China helped to make possible. But by continuing to let China get away with its direct and indirect assistance for the nuclear missile capabilities of North Korea, Pakistan and Iran, it can be said that the greater community of democracies are behaving in a suicidal manner. This is unacceptable; Washington, New Delhi, Tokyo and Seoul should condemn China’s proliferation and sanction the Chinese companies directly involved. The US and its Northeast Asian allies need to increase their missile defence investments and consider the re-deployment of US tactical nuclear weapons to deter Pyongyang. President Donald Trump appears to understand that he has little time to contain or reverse North Korea’s nuclear missile threat. His recent deployment to the region of aircraft carrier battle groups and cruise missile submarines underscores US frustration. Trump also appears to expect real support from China, and it should happen. But to get real results from Beijing, he is going to have to overcome his predecessor’s fear of Chinese truculence for telling the truth: China can only be a real help once it stops contributing to the threat. If China refuses to halt its proliferation, then it must be compelled to do so. Richard D. Fisher, Jr. is a senior fellow with the International Assessment and Strategy Center. NYC due to be hit by killer quake? Could a major earthquake shake the Big Apple to its core?If the past is any indication, the answer is yes, says John Armbruster, a seismologist at Columbia University’s Lamont-Doherty Earth Observatory.Based on historical precedent, Armbruster says the New York City metro area is susceptible to an earthquake of at least a magnitude of 5.0 once a century.Lynn Skyes, lead author of a recent study by seismologists at the Lamont-Doherty Earth Observatory adds that a magnitude-6 quake hits the area about every 670 years, and magnitude-7 every 3,400 years.A 5.2-magnitude quake shook New York City in 1737 and another of the same severity hit in 1884. Tremors were felt from Maine to Virginia. There are several fault lines in the metro area, including one along Manhattan’s 125th St. – which may have generated two small tremors in 1981 and may have been the source of the major 1737 earthquake, says Armbruster. There’s another fault line on Dyckman St. and one in Dobbs Ferry in nearby Westchester County. –“Beijing has vehemently protested the deployment, apparently concerned that the system’s powerful radar could be used to keep tabs on China, and it has imposed painful economic boycotts on South Korean companies in response. ‘The deployment of THAAD in South Korea will destroy the strategic balance in the region and bring about a further increase in tensions,’ Geng Shuang, a spokesman for China’s Foreign Ministry, told reporters Wednesday in Beijing. ‘The Chinese side strongly urges the U.S. and South Korea to cancel the deployment and withdraw the equipment.’” Full article here. See also – “Nuclear Mad Men” by Daryl Kimball for Arms Control Today here. Take action – Ready to restore checks and balances to the nuclear codes? Inspired by the legislation proposed by Rep. Ted Lieu and Sen. Ed Markey, Ploughshares Fund, along with sixteen other public interest groups, has created a new petition urging Congress to keep America safe by preventing any U.S. President from unilaterally launching a nuclear weapon. Sign and share the petition today. –“Col. Chris Moss, Vandenberg’s 30th Space Wing commander, said the test launch was ‘an important demonstration of our nation’s nuclear deterrent capability.’” For the full article, click here. –“A chilling return to Cold War nuclear dangers in addition to the more recent possibilities of nuclear terrorism and regional nuclear conflicts lead me to conclude that the likelihood of a nuclear catastrophe today is greater than it was during the Cold War. One thing is very clear: our policies are totally inadequate for dealing with these existential dangers. It should be the highest priority for this administration to develop policies that recognize this new reality, and then to devise new, robust programs that can mitigate them.” For the full article, click here. Calm the beat – “The drums of war are threatening to drown out the whispers of diplomacy with North Korea. Lost in the reverberations is the fact that Pyongyang is willing to negotiate — though not on US terms,” writes Leon V. Sigal for The Boston Globe. He argues that Pyongyang’s strategy has always been to play superpowers off of each other to minimize dependence on any single country. –“An improvement in US relations to reduce dependence on China remains Kim’s strategy. As initial steps, he may be willing to suspend his missile and nuclear programs in return for a scaling down of US joint exercises with South Korea and other reciprocal measures to address their security concerns. The only way out of this predicament is for Washington to resume talks with Pyongyang. And meanwhile, muffle those war drums.” For the full article, click here. –But Joe Cirincione reassures: “‘Deterrence works for North Korea, like it does any country… You drop a bomb on Seattle, North Korea’s toast… “What would they gain by hitting Seattle? Why would they do this? The only thing you can come up with is madness. Is North Korea mad? … Ruthless, brutal, immoral … [but] all this crazy stuff Kim Jong Un is doing is serving his interest,’ Cirincione said of the North Korean autocrat and his desire to stay in power.” Full article here. Watch: Director of Programs at Ploughshares on DPRK discuss Trump’s approach on North Korea here. See also – “The ‘axis of evil’ is back” by Aaron David Miller and Richard Sokolsky for CNN here. –“If the Trump administration is to challenge Iran’s dangerous actions, it has to prioritize those steps it most wants to prevent Iran from taking. Going nuclear should rise to the top of that list, and that priority should inform both the tone and substance of the Iran policy review now underway. By keeping the JCPOA on track, the Trump administration can both take on Iran more effectively and prevent some future administration from dealing with a more dangerous nuclear-armed adversary, something many wish had happened under George W. Bush with respect to North Korea.” Full article here. See also – “Iran Deal Is More Popular Than Ever, Poll Shows” by Cameron Easley for Morning Consult here. Job Announcement – Ploughshares Fund seeks applicants for a competitive, one-year paid position as a Roger L. Hale Fellow. The Fellow works primarily with the policy (analysis/advocacy) team to conduct research on current nuclear weapons-related topics, monitor government policy, and write for publication on the Ploughshares Fund website and other venues. The Fellow will be based in the Washington, DC office of Ploughshares Fund. For details, click here. –“Trump administration talks tough on North Korea, but frustrated lawmakers want details” by David Nakamura and Ed O’Keefe for the Washington Post here. –Listen: “Special North Korea Briefing for US Senators” ft. Jon Wolfsthal for BBC Newshour here. –“A Paradigm Shift in North Korea’s Ballistic Missile Development?” by Young-Keun Chang for 38North here. –“Iran’s top diplomat says you should ignore Trump’s comments on the nuke deal” by Adam Taylor for The Washington Post here. –“White House Intervened to Toughen Letter on Iran Nuclear Deal” by Jay Solomon and Carol E. Lee for The Wall Street Journal here. –“Toward a Fundamental Change in Nuclear Weapons Policy” Soka Gakkai International-USA. Thursday April 27, 2017, 9:00 a.m.-5:30 p.m. at the United States Capitol Visitor Center – Congressional Meeting Room South (CVC-217). Details here. –Markey-Lieu Press Conference on the “Restricting First Use of Nuclear Weapons” Bill. Wednesday May 3, 2017 from 12:00p.m.-1:00p.m. in Dirksen Senate Office Building Room 562. Details and RSVP here. –“Reducing the Threat of Nuclear War.” Featuring: Joe Cirincione, William Hartung, Elaine Scarry, and others. Massachusetts Peace Action. Massachusetts Institute of Technology. Saturday May 6, 2017, 9:00a.m.-5:00p.m. MIT Room 34-101, 50 Vassar St, Cambridge, MA 02139. Details here. –“Debate: Modernization of Nuclear Missiles.” Hosted by Project on Nuclear Issues (PONI) and Ploughshares Fund. Featuring: Jon Wolfsthal, Christine Parthemore, General C. Robert Kehler (Ret.) and Heather Williams. Tuesday May 23, 2017, 4:30p.m.-7:00p.m. at CSIS Headquarters 1616 Rhode Island Ave NW, Washington, DC 20036. Details here. –“The Women’s March to Ban the Bomb.” Women’s International League for Peace and Freedom. Saturday, June 17, 2017, 12:00p.m.-4:00p.m. Dag Hammarskjold Plaza, Greenmarket, 2nd Avenue, New York, NY 10017. Details here. Conn HallinanConn M. Hallinan is a columnist for Foreign Policy in Focus, “A Think Tank Without Walls,” and an independent journalist. At a time of growing tensions between nuclear powers — Russia and NATO in Europe, and the United States, North Korea and China in Asia — Washington has quietly upgraded its nuclear weapons arsenal to create, according to three leading American scientists, “exactly what one would expect to see, if a nuclear-armed state were planning to have the capacity to fight and win a nuclear war by disarming enemies with a surprise first strike.”Writing in the Bulletin of Atomic Scientists, Hans Kristensen, director of the Nuclear Information Project of the Federation of American Scientists, Matthew McKinzie of the National Resources Defense Council, and physicist and ballistic missile expert Theodore Postol conclude that “Under the veil of an otherwise-legitimate warhead life-extension program,” the US military has vastly expanded the “killing power” of its warheads such that it can “now destroy all of Russia’s ICBM [intercontinental ballistic missile] silos.”The upgrade — part of the Obama administration’s $1 trillion modernization of America’s nuclear forces — allows Washington to destroy Russia’s land-based nuclear weapons, while still retaining 80% of US warheads in reserve. If Russia chose to retaliate, it would be reduced to ash. Any discussion of nuclear war encounters several major problems. First, it’s difficult to imagine or to grasp what it would mean in real life. We’ve only had one conflict involving nuclear weapons — the destruction of Hiroshima and Nagasaki in 1945 — and the memory of those events has faded over the years. In any case, the two bombs that flattened those Japanese cities bear little resemblance to the killing power of modern nuclear weapons. The Hiroshima bomb exploded with a force of 15 kilotons, or kt. The Nagasaki bomb was slightly more powerful, at about 18 kt. Between them, they killed over 215,000 people. In contrast, the most common nuclear weapon in the US arsenal today, the W76, has an explosive power of 100 kt. The next most common, the W88, packs a 475-kt punch. Another problem is that most of the public thinks nuclear war is impossible because both sides would be destroyed. This is the idea behind the policy of Mutually Assured Destruction, aptly named “MAD.” But MAD is not a US military doctrine. A “first strike” attack has always been central to US military planning, until recently. However, there was no guarantee that such an attack would so cripple an opponent that it would be unable — or unwilling, given the consequences of total annihilation — to retaliate. The strategy behind a first strike — sometimes called a “counter force” attack — isn’t to destroy an opponent’s population centers, but to eliminate the other sides’ nuclear weapons, or at least most of them. Anti-missile systems would then intercept a weakened retaliatory strike. The technical breakthrough that suddenly makes this a possibility is something called the “super-fuze,” which allows for a much more precise ignition of a warhead. If the aim is to blow up a city, such precision is superfluous. But taking out a reinforced missile silo requires a warhead to exert a force of at least 10,000 pounds per square inch on the target. Up until the 2009 modernization program, the only way to do that was to use the much more powerful — but limited in numbers — W88 warhead. Fitted with the super-fuze, however, the smaller W76 can now do the job, freeing the W88 for other targets. Before the super-fuze was deployed, only 20% of US subs had the ability to destroy re-enforced missile silos. Today, all have that capacity. Trident II missiles typically carry from four to five warheads, but can expand that up to eight. While the missile is capable of hosting as many as 12 warheads, that configuration would violate current nuclear treaties. US submarines currently deploy about 890 warheads, of which 506 are W76s and 384 are W88s. The land-based ICBMs are Minuteman III, each armed with three warheads — 400 in total — ranging from 300 kt to 500 kt apiece. There are also air and sea-launched nuclear tipped missiles and bombs. The Tomahawk cruise missiles that recently struck Syria can be configured to carry a nuclear warhead. So far, the world has managed to avoid a nuclear war, although during the 1962 Cuban missile crisis it came distressingly close. There have also been several scary incidents when US and Soviet forces went to full alert because of faulty radar images or a test tape that someone thought was real. While the military downplays these events, former Secretary of Defense William Perry argues that it is pure luck that we have avoided a nuclear exchange — and that the possibility of nuclear war is greater today than it was at the height of the Cold War. In part, this is because of a technology gap between the US and Russia. At the time, calmer heads prevailed and the Russians called off their alert, but for a few minutes the doomsday clock moved very close to midnight. According to the Bulletin of Atomic Scientists, the 1995 crisis suggests that Russia does not have “a reliable and working global space-based satellite early warning system.” Instead, Moscow has focused on building ground-based systems that give the Russians less warning time than satellite-based ones do. What that means is that while the US would have about 30 minutes of warning time to investigate whether an attack was really taking place, the Russians would have 15 minutes or less. That, according to the magazine, would likely mean that “Russian leadership would have little choice but to pre-delegate nuclear launch authority to lower levels of command,” hardly a situation that would be in the national security interests of either country. Or, for that matter, the world. A recent study found that a nuclear war between India and Pakistan using Hiroshima-sized weapons would generate a nuclear winter that would make it impossible to grow wheat in Russia and Canada and cut the Asian Monsoon’s rainfall by 10%. The result would be up to 100 million deaths by starvation. Imagine what the outcome would be if the weapons were the size used by Russia, China or the US. The US Ohio class submarine is armed with 24 Trident II missiles, carrying as many as 192 warheads. The missiles can be launched in less than a minute. The Russians and Chinese have missile-firing submarines as well, but not as many and some are close to obsolete. The US has also seeded the world’s oceans and seas with networks of sensors to keep track of those subs. In any case, would the Russians or Chinese retaliate if they knew the US still retained most of its nuclear strike force? Faced with a choice committing national suicide or holding their fire, they may well choose the former. The other element in this modernization program that has Russia and China uneasy is the decision by the Obama administration to place anti-missile systems in Europe and Asia, and to deploy Aegis ship-based anti-missile systems off the Pacific and Atlantic coasts. From Moscow’s perspective — and Beijing’s as well — those interceptors are there to absorb the few missiles that a first strike might miss. In reality, anti-missile systems are pretty iffy. Once they migrate off the drawing boards, their lethal efficiency drops rather sharply. Indeed, most of them can’t hit the broad side of a barn. But that’s not a chance the Chinese and the Russians can afford to take. The new Russian cruise missile may indeed strain the Intermediate-Range Nuclear Forces Treaty, but it is also a natural response to what are, from Moscow’s view, alarming technological advances by the US. Had the Obama administration reversed the 2002 decision by George W. Bush’s administration to unilaterally withdraw from the Anti-Ballistic Missile Treaty, the new cruise might never have been deployed. There are a number of immediate steps the US and Russia could take to de-escalate the current tensions. First, taking nuclear weapons off their hair-trigger status would immediately reduce the possibility of accidental nuclear war. That could be followed by a pledge of “no first use” of nuclear weapons. Building Societies are trying to ensure that some of their customers will be left come the nuclear day of reckoning. The majority of major societies, it seems, are quite happy to lend money for the building of fallout shelters. Such buildings have had a spectacular revival this year. But those with swimming pools already being built need not worry. The manufacturer of a DIY shelter, which retails, for £1,200 plus VAT reckons that a swimming pool (empty) would be the ideal place in which to erect a shelter. Mr Bill Jones, the company’s sales director, said one of the problems after a nuclear attack could well be people without shelters trying to take over the shelters of the more provident. It was for this reason he suggested that his shelter be kept parcelled up, so that the neighbourhood nasties did not know it existed. “Any nuclear war will be preceded by days or at least hours of traditional warfare.” he said. The Abbey National said it had no objection in principle to a loan for a shelter, provided it was more solid than the instant variety. A spokesman for the Inland Revenue said that whether a borrower could claim tax relief on such an investment would be up to individual tax inspectors, who would have to decide if the shelter constituted a genuine improvement. SEOUL/UNITED NATIONS North Korea test-fired a ballistic missile on Saturday, South Korea’s and U.S. militaries said, defying intense pressure from the United States and the reclusive state’s main ally, China. U.S. and South Korean officials said the test, from an area north of the North Korean capital, Pyongyang, appeared to have failed, in what would be a fourth successive unsuccessful missile test since March. The test came as U.S. Secretary of State Rex Tillerson warned the U.N. Security Council that failure to curb North Korea’s nuclear and ballistic missile programs could lead to “catastrophic consequences”. U.S. officials, speaking on condition of anonymity, said the missile was probably a medium-range weapon known as a KN-17 and appears to have broken up within minutes of taking off. South Korea’s military said the missile, fired from the Pukchang region in a northeasterly direction, reached an altitude of 71 km (44 miles) before disintegrating a few minutes into flight. Tension had spiked on the Korean peninsula over concern the North may conduct a long-range missile test, or its sixth nuclear test, around the time of the April 15 anniversary of its state founder’s birth, or the day marking the founding of its military this week. The timing of the launch suggested it was calculated to send a message as North Korea remained under the scrutiny of world powers, said Kim Dong-yub, an expert at Kyungnam University’s Institute of Far Eastern Studies in Seoul. South Korean and U.S. forces have been conducting annual military drills since the beginning of March that conclude at the end of April. Kim said North Korea might have obtained the data it wanted with the missile’s short flight, then blown it up in the air. U.S. President Donald Trump told Reuters in an interview on Thursday North Korea was his biggest global challenge and a “major, major conflict” with it was possible over its nuclear and ballistic missile programs. Trump said and he praised Chinese leader Xi Jinping for “trying very hard” to rein it in. The Trump administration could respond to the latest missile test by speeding up its plans for new U.S. sanctions, including possible measures against specific North Korean and Chinese entities, a U.S. official told Reuters. “Something that’s ready to go could be taken from the larger package and expedited,” said the official, who declined to be identified. The launch could also give Trump leverage to press the Chinese to do more to rein in the North, the official added. Earlier, both China and Russia rebuked a U.S. threat of military force at a meeting of the U.N. Security Council on North Korea. “The key to solving the nuclear issue on the peninsula does not lie in the hands of the Chinese side,” Wang told the council in blunt remarks that Tillerson later rebuffed. Such routine condemnation and a series of sanctions resolutions since 2006, when North Korea conducted its first nuclear test, have done little to impede its push for ballistic missiles and nuclear arms. Japan condemned the launch as absolutely unacceptable and a violation of U.N. resolutions. There was no immediate reaction from China.